I ended my previous post on life insurance with the question “how much should you buy?” I will address it in this post. First you have to figure out how much income you need to replace for your beneficiaries. You don’t have to replace 100% of your gross income because if you died, you would stop earning a salary, and you wouldn’t have to pay taxes on that salary either. You also wouldn’t have to contribute to your 401k and retirement savings any more because you don’t no longer need them (you died). For me, taxes and retirement savings take up more than half of my income. Some of the household expenses directly attributable to you would be gone (you wouldn’t need a second car); and some other expenses might go up (perhaps your family is on your health insurance). After figuring out how much income you will need to replace, you can run some numbers. According to a life insurance needs calculator, a 30-year-old wanting to replace $30,000 income for 20 years, with 3% inflation and 6% investment return, will need life insurance for $463,507. Should you deduct from the need number the free insurance you already have from work? I didn’t. I didn’t because the free insurance from work is usually not portable. If I leave my job, my insurance ends. My next employer may not give me free life insurance. I treat the free insurance simply as extra. All else being equal, the amount needed for life insurance goes down over time. It takes more money to replace income for 30 years than what it takes for 20 years. If you survived the first ten years, you would need less insurance than ten years ago because you only need to cover a shorter time. However I haven’t seen a policy that will automatically reduce the face amount over time. So perhaps you should buy more when you are young and review your need again every 5 years. Term life insurance is cheap, especially when you are young. You really don’t have to pinch on the coverage. The cost per $100,000 also goes down the more coverage you buy. 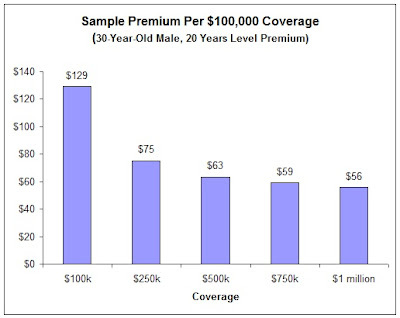 See chart below for sample annual premiums per $100,000 coverage at different coverage levels. For this hypothetical 30-year-old male, the cost difference between $100,000 coverage and $250,000 coverage is only about $60 a year. Next, which is also the last post in this mini series on life insurance, researching insurance company ratings. Stay tuned. I think the rule of thumb is 10 times income. Is it not enough? It’s clear to me, after having worked with tens of thousands of customers over the years, that the “rules of thumb” don’t work. The economic value of a human life is routinely underestimated by most “experts”. You may want to use a calculator that figures out the present value of a future income stream, selected by the user, and it works pretty well. But it IS mathematical, and unfortunately, some people don’t relate to numbers very well. One simple way I’ve found to estimate the economic value of your life, intuitively, is to ask yourself the question, “If I could receive, in cash, the death benefit on my life insurance today, would I be willing to work (and live) the rest of my life without pay?” If you say, “yes”, then you probably have enough life insurance. If not, you don’t! You recommenended yet another need calculator that ignores the social security benefits to widows/children. They are dime a dozen (though that one is at least simple). Is there one that doesn’t ignore this factor? You brought up a good point. Social Security pays benefits to children up to a certain age if one dies. Social Security Administration sends benefits estimate by mail every year. They also provide some online calculators. The Social Security benefits can be deducted from the replacement income need number. If there is not already a calculator online that incorporates this, I promise to make one.